I was greeted by a fierce downstream wind when I arrived at the fishery, but at least the car park was empty. I have not been getting onto the rivers as much as I would like this is down to a lot of Loch Style fishing and various other commitments. In truth though the last few times I have made the effort the river has had a coloured tinge to it that I am not used to. The fishing has been mediocre at best, that coupled with the fact that I can only squeeze in a few hours here and there has not helped. I had been chatting to Steve Cullen the other day and we were talking about fishing water that you did not fancy in order to improve. There is a lot of merit in that, so I decided to go straight to a part of the river I have not enjoyed much success on. I made the long walk down towards the bottom of the beat with not another soul in sight. The water was heavily coloured and in the deeper pools visibility was hard to gauge. Usually you can see right in and sight fish, this was not going to be possible today though and I would have to rely on the fish rising to give me a clue to their location. I sat on a bench tackling up my 9’ 6” for #3, I usually fish the #2 here but with the wind I thought it prudent to bring something with a bit of backbone. As I sat one eye on the river there was nothing showing and my heart sank. I began to fish blind putting my fly in likely spots to no avail the water colour was poor and I was convinced this was putting the fish off. I arrived at the area where wading is permitted and as I surveyed the water the tell-tale plop of a small fish could be heard. On closer inspection, a few fish could be seen rising in a back eddy on the other side of the river. I waded across and after several attempts I managed to get my fly on a dead drift right through the fish holding area. A little Grayling came to claim it, only 25cm but I was grateful for its attention. Several more of a similar size followed and my spirits lifted a little. Now where were those Brown trout hiding. Not more than twenty steps up river there were more fish rising, I thought at first, they were again a shoal of small Grayling. But stopping to watch for a bit I could see at least one Brown, used to the wind I bided my time and waited for the gusts to stop. The cast was good and the Brown rose perfectly taking the small sedge pattern. Only small but perfectly formed wild fish, a smile crept onto my face things were picking up! As I moved carefully upstream listening and watching several more fish came to my net, nothing more than a pound but plenty of them. I had been in the water a while when I realised I was starting to feel the chill on my legs. Time to get out and have a bit of a warm up and a walk further upstream. The sun had come out and it was warming me up a treat, there was a full-on hatch on the go and fish were showing regular. Having had my fill of the smaller fish I was looking for something a bit better so kept my line dry watching as I walked for a decent Brown. My patience was rewarded when a good fish rose head and tail out of the water just opposite where some stairs to help anglers in and out the water were positioned. 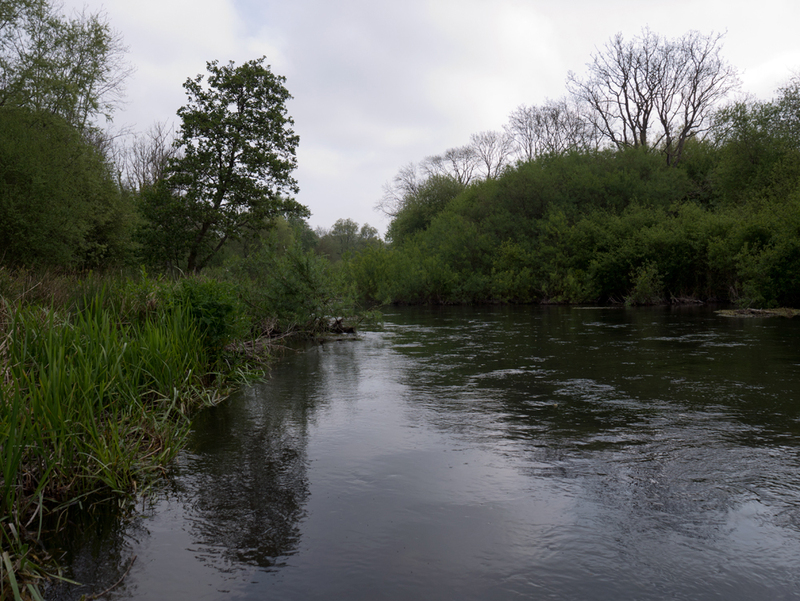 I slid into the water downstream of my quarry while doing so my left hand swept through some stinging nettles. This fish better be worth it I thought to myself, I made a few casts in the area where I had seen the fish, nothing doing. The fish failed to show itself again, on a hunch I swapped my dry fly to a small #22 black parachute. My eyes are shot and this took a little longer than I would have liked or even care to admit! Entomology is not really my bag but I can tell the difference between a black fly and a green fly so the smallest black fly in my box seemed appropriate. Eventually though everything was set, first cast the fish came and smashed the fly. It played really nicely and although there was a big kafuffle on the surface the fish pretty much bounced all the way to the waiting net. It was a big fish the biggest I have had to date from the Avon at 2.5lb (est). I was a little disappointed to find on closer inspection that it was a stocked fish the pectoral fins were a little damaged. I got a few quick snaps and released the fish back to a deep run to the edge of the river. Feeling rather pleased with my efforts I pushed on upstream fish were rising all over now smashing into the clouds of small black flies hatching off. They were not around for long though as the wind would catch them and they were gone. I persevered with one fish which I thought looked reasonable but after several fly changes I was left scratching my head a bit. Right the smallest thing in my box, #24 it took all my patience and a sit down to thread the tippet through the eye. A further mammoth effort to tie it on and I was ready. 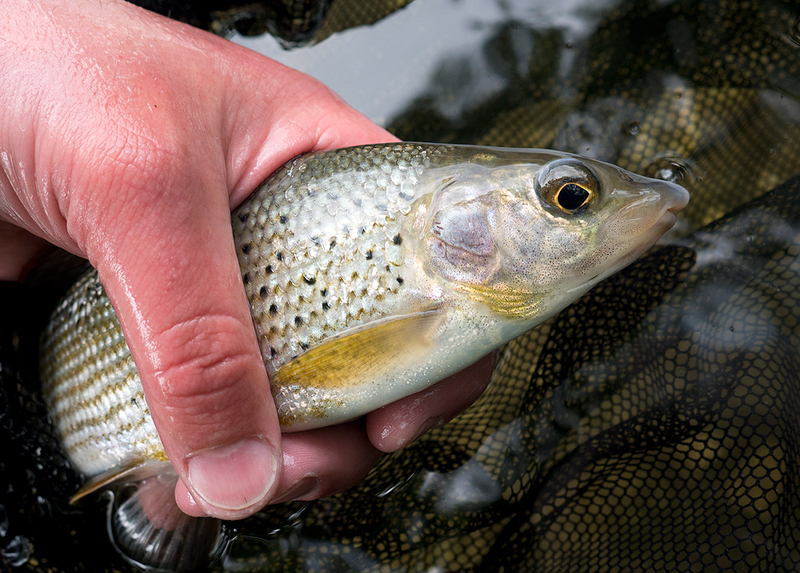 The fish duly obliged but it was only a Grayling of around 30cm, ah well they all need love. I stopped at the car for a quick bite to eat as I looked at my watch my time was running short. If it had not been so good I might have called it a day then and there. I was having fun though and I hot footed it back down to the river for a last hour. As I reached the river there were already three anglers fishing the bit I was going to give a go. I safely negotiated my way past them passing the time of day with my fellow fisherman. My time was short though and I was keen to get a few more casts in. As I made my way upstream I was greeted with the sight of another angler just entering the wading section. Bugger I sat on the one of the many benches scattered up and down the bank. Looking at the river it was alive with small fish rising, it was pretty impressive. There were several rises though that were not small fish and those were the one I was interested in. The Brown trout were up and feeding hard. 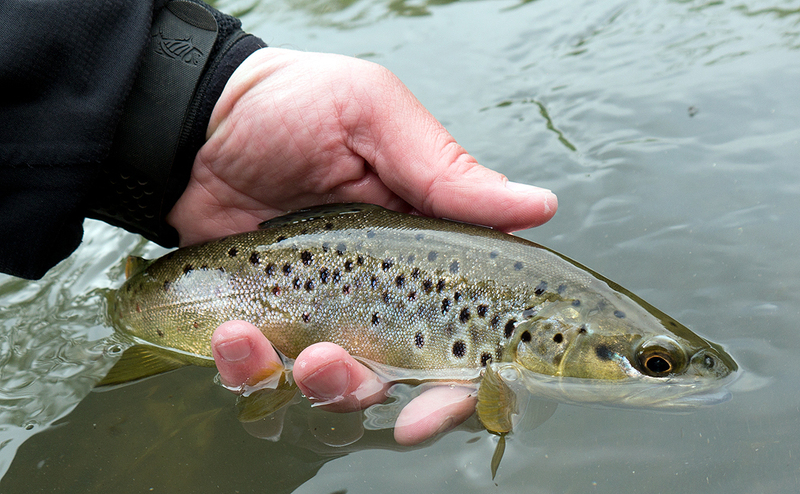 I think I spent more time changing through flies that actually fishing but failed to tempt any of the big Brown trout. Only being rewarded by the odd Grayling. My time really had run out though and it was time to head home. The river to me looks like it is just on the cusp of being back to form. 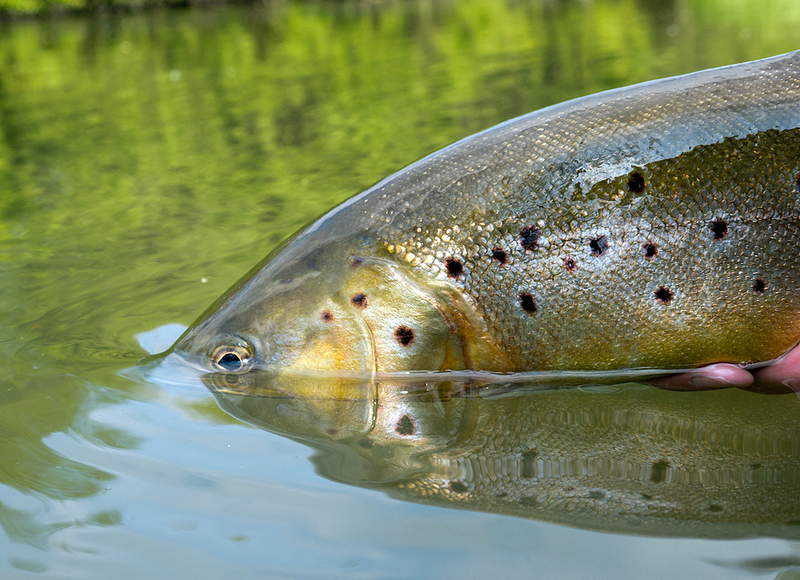 With any luck the colour will drop out of the river soon and we should be able to get back to sight fishing. A great wee session though and hopefully I can get back real soon. Look out for my review coming soon on the WYCHWOOD GEAR TRAP SHORT HAUL.